Today I have a super simple birthday card for you! This is a great one to whip up when you need a last minute birthday card! Plus, this card is a great way to use up some scraps. See that 1/4" wide piece of Tangerine Tango. Do you think I used a brandy new piece of cardstock? Heck no! Dig through your scraps and you sometimes may find just the right size piece! 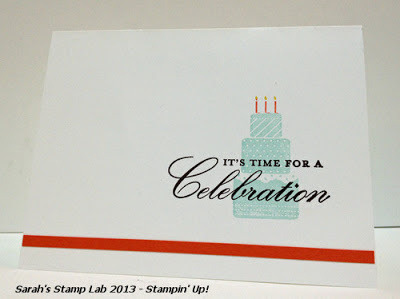 Stay tuned for Friday's post....I'll be Steppin' this card up!